MTSU ranked among top schools .. The most recent Tennessee Consumer Outlook Survey indicates consumers across the state are feeling much more optimistic about the economy during this holiday shopping season. The Tennessee Consumer Outlook Index soared to 113 from 47 in September, according to the latest statewide snapshot of consumers by Middle Tennessee State University’s Office of Consumer Research. The quarterly survey consists of a series of questions that measure areas such as how consumers feel about the local, state and national economies as well as their personal financial situations and the job market. The current survey of 630 Tennessee consumers was conducted between Dec. 1 and Dec. 8, with a margin of error of 4 percent. A copy of the full report and previous report are available at www.mtsu.edu/consumer/tnoutlookreports.php. When asked about the possible effects of the recent presidential election on the economy, the majority of Tennessee consumers expect that Trump’s victory will have a positive effect on the future of the overall American economy. In addition to tracking an overall index, the outlook survey also includes sub-indices that measure consumers’ outlook on their current financial situations, their future expectations and their purchasing plans. 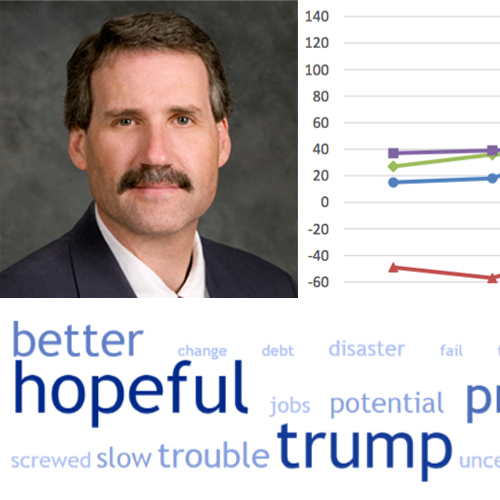 Overall, Tennessee consumers feel much more optimistic about the future of the economy, Graeff noted, with the Future Expectations Index rising significantly from 28 to 80. “In general, Tennessee consumers have found renewed optimism regarding the future of the overall American economy, the state’s economy, the job market, their personal financial situation, the stock market, and the value of their savings and investments,” Graeff said. Consumers were also asked specifically about their shopping and spending plans for the Christmas and holiday season. When asked if they did any shopping over the Thanksgiving weekend (including Cyber Monday), most consumers either made purchases online (40 percent) or went to big box retailers such as Walmart or Target (37 percent). Three in 10 (30 percent) did not do any shopping during the traditional Thanksgiving weekend shopping days. Improving optimism regarding the job market and personal finances means consumers may be more willing “to open up their wallets and spend money” in the future, Graeff said.